Custom Imprinted Cool Shades LED Sunglasses consists of 10 LED lights and they are best known for showing off your brand’s patriotism. The classic shape and Red, Blue and White LED lights are the major highlights of these custom party sunglasses. Corporate events, theme parties and Fourth July celebrations can be made rich by the use of these custom sunglasses. Get your brand logo imprint in the 1.4" x 0.2" imprint area to achieve double impact. Order today to achieve free online proofs and free artwork design services. 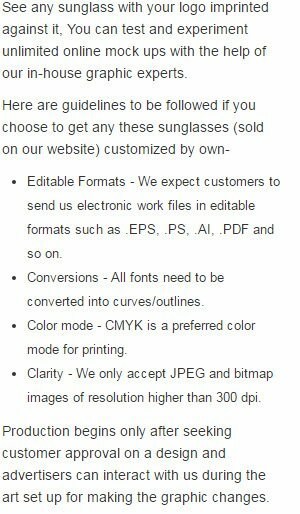 Request a quote to know price cuts that you can avail for wholesale Custom Imprinted Cool Shades LED Sunglasses.